Don't like the Facebook News Ticker? Here is a simple video to teach you how to do it. A picture worth a thousand words, a video worth a million words? Never mind, just click play on the video below. Note: for FireFox and Chrome only. With Google Plus open up to public, meaning everyone can register with Google Plus. If you still not on Google Plus, you no longer need someone in Google Plus to invite you. Just go to the Google Plus link and click to register. source: I wrote this, and video is from youtube! Our cute star is afraid of the height. Use your finger to destroy the blocks, and land the star on the safe base. You can earn points by completing levels, and use the earned points to buy powerups in the in-game store. - 8 different worlds (120 levels, more levels will be included in the updates). - Simple, funny, colorful, relaxing. - Many creative, and challenging levels. - 3 relaxing music tracks. - Auto-save at the end of each level. - All saved game files are stored on your SD card. You can copy the files, and transfer them to other devices. Oct 4 Is iPhone 5 Day? Rumor says Oct4 is the day iPhone 5 will be announce. Sure or not? Usually rumor can be 50% true and 50% false. However, wait and see. Apple already lost an iPhone5 at a bar in US recently, however that didn't create much news because people know it is a fake news, bahhahah. :D Have a nice weekend! If you are Windows user, regardless Windows XP, Windows Vista, Windows 7 or Windows 8 (anyone already on Windows 8??? ), you should have use Windows Explorer before. Even you always use "My Computer" to find the files, but it is actually Windows Explorer, just without the Folder view. I use Windows Explorer a lot, both at work or at home. Copy files, move files, delete files, open files. And I use a few of Windows Explorer windows at any time, because I am too lazy to browse through the folder again every time I need to open it, so I just leave it. But that become very cluster, and messy with so many windows opened. So I start thinking if there is any multi-tab Windows Explorer? We have some many multi-tab web browsers, Firefox, Safari, Opera and IE also before multi-tab after some many years lack of this function after FF or Safari or Opera already have multi-tab. Forget about web browsers, and there is a multi-tab Windows Explorer, but as always, it is not from Microsoft. But luckily this multi-tab Windows Explorer is a free software! Yeah! Because I am too lazy to take snapshot of Explorer++, so I just take the screenshots from it's website, hehe. And I will do some intro to the features of Explorer++. Firstly, the view, it can be just like the original Windows Explorer, nothing much. Of course you can customize to add in more column in detail view, again, same like original Windows Explorer. Third, you can change the attribute of files, again, same like Windows Explorer, but you can change the modification/creation/accessed date of each file. To do that, select the file(s) and then click "File" and then "Set File Attributes". Forth, it can bookmark the folder that you want to open regularly. And best of all, it is multi-tab, if you click on any of the picture above, you can already see the multi-tab. So no more messy with more than 10 Windows Explorer, because all of them can be open in muti-tab of Explorer++. Okay, to get it, you can either get it from portableaps.com which will install the portable version for you. p/s: submit your software/hardware/smartphone/tablet for review here, contact me at ahsiang888 at gmail.com. But be warned, I will write what ever is true if your stuffs really bad. This free download expire on September 29, 2011, just a few more days, go download it now! I only found out this recently, everyone can get Angry Birds Rio for Windows for Free! Thanks to Intel AppUp, if you register with Intel AppUp now, you can get Angry Birds Rio for your Windows XP and Windows 7, and it is completely free and also it is a legal download software, so no need to worry that is it illegal download or not. It didn't mention about Windows Vista though, but I think it should work as well. Download Intel AppUp and install it on your Windows. Launch Intel AppUp, Click "Sign In" and then "Get one here" to create new account in a pop up windows, fill in name, email, password, and check on to agree terms and conditions blah blah blah, the trick is to stop at payment option registration. Okay, now go back to the AppUp, sign in with email and password you registered just now, wait for it to sign in and download whatever needed to be download. You should able to find Angry Birds Rio for free on the AppUp. Click download and wait for it. Depend on your network/broadband, it will take a while since it is ~46MB. p/s: I am lazy to take snapshot, just go download it now before expire! Play Tetris with Mats and display is 6' LED Matrix? This get me wonder, why not just get an 52-inch LCD TV? Anyway, have fun watching this video. source: video is from youtube! Microsoft hold Windows 8 Developer Preview recently, here is the official highlight from MS.
And recently I just did a survey, even though it didn't said it is from MS, but from the questions it asked, I can tell it most probably from MS. Warning: It will wipe out all older version of Windows. Make sure you backup your system first. And this is a one way ticket, meaning you have to reformat the whole system if you want to get back to Windows 7 or older. source: I wrote most of this post, but video is always from youtube! Since I am starting a new job roles now, so I have to focus a lot of the new job. So I will change my posting frequency to alternate day. Usually should be on even date. However I will post it on same day if I found something very interesting to share. Little Plastic Man: Don't mess with these birds! With ever popular Angry Birds in world wide, why not make these Birds for your children or someone children or make these for the less fortunate one or just for yourself? Regardless who you want to make these for, try to use recycle papers and anything that is friendly to the environment. Are you Angry Birds addict? Are you addicted Angry Birds? I did, yes, I was. But since I am too busy with work now, it have to be stop at some point. So I only play Angry Birds once in a while. Glad that I have recover from Angry Birds addict, I was playing it as soon as I reach home from work. Do you know how many people are Angry Birds addict? What is the breakdown of these Angry Birds addicts? Similar to Motorola Droid X2 but with LTE support, this Motorola Droid Bionic only available in US, from Verizon. This round iFixit is teardown this phone, and they commented that this is a most friendly device for teardown because it easiest to assemble back after teardown. Some of the stuffs that showed in these movies probably are with our daily activities, but I hope the bad stuffs don't happen. You know what I mean, example 2012. So back to this WP7 app, written by member of XDA, this is a free WP7 app that you can use it to flip a coin, and decide your fate, good luck! HTC Radar - just another WP7? Summary, strangely WP7 never being mention in any of the video. HTC shy to let people know it is a WP7 phone? source: youtube and I wrote this! Some creative people make a music just using sounds from Windows 98 and XP. Have a nice Sunday! It is World's Shor......wait for it......test Train! What happen if Superman want to register on Google+? I never thought of Windows can do this, yes, just Windows, and its default programs. No third party software, no need freeware or paidware. Just Windows. Surprisingly! Yesterday I wanted to print a map on more than one pages (so that I get a bigger picture), so I tried my favourite image viewer see if it works, but somehow it don't have that option, too bad. Of course I can fire up my freeware Photoshop equivalent software, which is GIMP, and start splitting up the image to a few pieces and then print one by one. But that would take more time right? So I go to Google and Google it as usual. 1. Open the image that you want to print with Paint (Start -> Accessories -> Paint). Or copy the image and paste it on Paint once you have open it. 2. Select "Print" -> "Page Setup" (Windows 7 and Vista), or "File" -> "Page Setup" (Windows XP). 3. At "Scaling", select "Fit to" and then change the setting to "2" by "2" page(s ). 5. Print the image from Paint, make sure you select to print "All Pages". That's it, you then can collect the print out from printer and merge them (with scissors and glue, to trim down the white spaces and stick them) if you want to. Also you can play with the print margin to reduce the white spaces as much as possible. Should apply to Windows XP, Windows Vista and Windows 7. Blogger has new look now. Using the same old interface for a few years already, suddenly need to change. 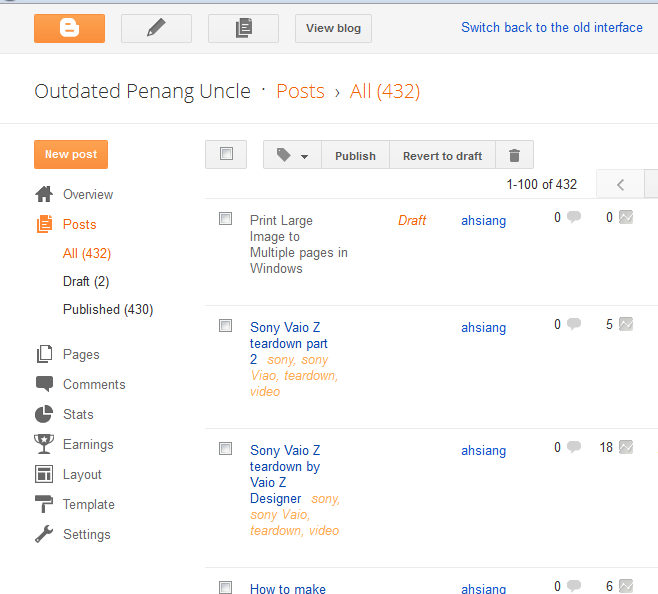 But luckily it all just make it look nicer, so that it don't looks like dinosaur age blogging platform. But did Google improve the performance? Anyway, why with the cosmetic change? I think it is because other blogging platform are catching up with blogger. So Google has to do something about it. I am writing a new post regarding printing large image to multiple pages, still work in progress. Note the "Publish", "Save", "Preview" are on top right, not below the writing box anymore. Also a "close" button(? ), wonder what it does, close without save? 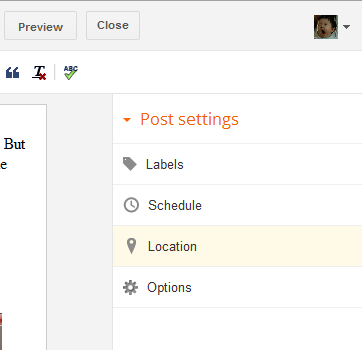 Other settings for each post moved to right side of the writing box. You can see how many comments and pageview for each post. Others settings like Layout, Settings, etc are at left side of the page. I start to like this new interface, will continue use this for another few days. However if you don't like it, you still able to to switch back to the old interface, at right top of above picture. Again, I hope Google improve the performance and stability of blogger as well. There was some outage over the years. Another thing we can do is to speed up the loading time, like what I did in this post. Anyway, this is a teardown video on latest Sony Vaio Z by Sony official channel on youtube, called Sony Sgnl (pronounced as "Signal"). How to make ubuntu easier to use? Until today, there are a lot of people think that Linux is the GUI/interface that looks like the computer monitors within Matrix movie, everything is in codes, codes and codes. Well, that is not true anymore, for many years already. There are a lots of Linux variant out there, including ubuntu. 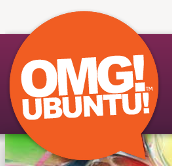 A website from UK is a good reference to make your experience with Ubuntu as fun as possible, introducing OMG! Ubuntu! Even you are not Ubuntu user, probably it is a good source to see if you want to switch to Ubuntu. Btw, Happy belated 20th birthday Linux! Nokia recently has announced 2 cheap and good phone, Nokia 100 and Nokia 101. Target for emerging market, these 2 phone has to be cheap and good. Priced at only 25 euros (US$35) and 20 euros (US$30), respectively, still they are a huge investment for people from country that have average yearly income less than average silicon valley employee's daily income. source: I wrote this and video is from youtube! Sean Mullen and Ben Harper of the Irish School of Animation created an animation called "Blip", where two aliens try to take over the same world. I like it a lot because it is cute and has a meaning at end of the clip. Enjoy!